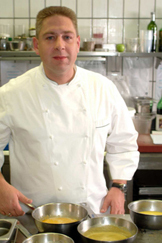 Matthias Buchholz decided to become a chef at age 16. Since then has become a passionate and dedicated award-winning chef, whose partial list of awards include: Berlin Chef of the Year 2000, GaultMillau Chef of the Year 2001, and Star Diamond Award from the The American Academy of Hospitality Sciences 2004. 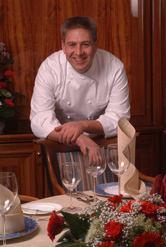 Executive Chef Matthias Buchholz joined the restaurant first floor in 1996, and in 1997 the restaurant received its first Michelin star. Although it is difficult to obtain a Michelin star, it is even more difficult to maintain a star rating, which Chef Buchholz has continued to achieve each year. When not busy in the kitchen dreaming up new recipes to tempt first floor guests, he is hard at work writing new cookbooks, often seeking inspiration from his impressive library of cookbooks which number over 800, including a 1820s and 1935 Old English cookbook. He is the first person to do an audio cookbook "Cooking with Matthias Buccholz" (in German) for a complete menu with recipes, and is finishing a new cookbook which includes ten years of recipes from first floor. He loves to travel and spent one week in Thailand discovering new products, which I am sure will find a way into new recipes as well as his cookery classes at the restaurant offered six times per year. Preparation: Gently heat sesame oil, add and simmer pepper, shallots, ginger, garlic, lemon leaves and cashew nuts. Stir in the curry paste, fish sauce, soy sauce, poultry bouillon and coconut cream. Heat to a boil and blend. Add cilantro and lemon pieces and let soak for 20 minutes, and then strain through a fine strainer. Season to taste if necessary, and refrigerate until used. Finish: Fry the prawns in the pan and serve with Asian vegetables (choice of type and quantity) and serve in a bowl with the red curry sauce. Preparation: Pull off head and pincers with a slight twist (not to be consumed). Slightly squeeze tail until the lower side of the carcass breaks open. Break off the shell from the inside to the outside. Cut dough sheets diagonally into halves. Brush on fish farce along the long side at the center, then position one prawn. Brush with farce and cover with a parsley leaf. Roll in the dough with the stuffing, pull the ends up, twist and fix with kitchen twine. Preparation: Sauté shallot Brunoise and jalapeño in olive oil. Caramelize sugar and pour in Sauternes wine. Add the vanilla pulp, the vanilla bean, pepper and the star anise. Reduce until a syrup-like consistency has been reached, strain. Add the shallot- jalapeño mix and the Physalis and heat to boiling. Preparation: Sauté shallot Brunoise in olive oil until shallot is translucent. Add the other ingredients and season to taste with salt, pepper and sugar. Heat vinaigrette to boiling. Let vinaigrette cool, stir in the chopped egg white, chive rolls and the nuts. Preparation: Wash and coarsely chop rucola salad and add into a stationary blender with the Parmesan cheese and roasted hazelnuts. During the blending process, slowly pour in the hazelnut oil. Season the pesto to taste with salt and pepper, and refrigerate. Please use a light-resistant sealable container or wrap bowl in aluminum foil, and cover. Finish and Serving: Cut the beef tenderloin into 0.3 cm thin slices and place them on plastic foil or baking paper. Tenderize the beef slices, serve on plates, and season with salt and pepper. Then marinate with the shallot egg vinaigrette. Fry the prawns in the deep fryer until golden and serve on the plate with the Chutney. Add the rucola nut pesto. If desired, decorate with rucola. Brush the tuna pieces on all sides with olive oil and sauté in a very hot skillet (approximately 1 minute per side). Place the pieces on a plate and let them rest for approximately 8 minutes but do not let the tuna cool completely. Season with sea salt right before serving. Preparation (may be done on the day before): Mix the ingredients, heat and reduce to half. Add peanuts. Preparation: Blanch tomatoes, followed by a cool bath in ice water, and peel tomatoes. Pour the remaining ingredients in a pot and heat to boiling. Cook tomatoes in this bouillon for approximately 1 minute and simmer for 2 hours. Remove the tomatoes, strain them for approximately 2 hours and put them in the oven to dry at 115°C (250 F) for 4 hours. Let them cool at room temperature for another 4 hours. Preparation: Peel the asparagus right underneath the top and blanch in boiling salted water until al dente, followed by a cool water bath. Cut off the woody asparagus ends. Preparation: Preheat oven to 180°C (356° F). Season the pre-cut lamb shoulder with salt and garlic. In a baking dish, brown in butter oil on all sides and put the meat in the oven. After approximately 20-25 minutes add celery, onions and tomato quarters to the lamb shoulder and wait for it to brown. Pour red wine and lamb broth on top of lamb shoulder and cover with water. During the roasting, pour broth over the shoulder once in a while. As soon as the meat can be easily separated from the bone, remove it from the oven and place it on a plate or a bowl, cover it and let it rest. Strain the sauce and reduce it down to the required consistency. Bind the sauce with butter or potato starch if required. Fork test: Pierce roast with a meat fork, if the meat slides easily of the fork, it is ready. Preparation: Empty Couscous into a bowl. Heat olive oil and sauté shallots and jalapeño peppers. Add the other ingredients and heat to boiling. Add one third of the mixture to the Couscous in 5-minute intervals, and stir. Cover the bowl with a cloth, and let the Couscous expand. Preparation: Peel onions, cut into quarters and small strips. To fight the acidity, blanch the onion briefly in boiling water. Add 2-3 drops of lemon juice to the marinade to give the onion strips a slightly red color. Wash the leaf parsley, drain and dry with kitchen paper. Put parsley and onion in a small bowl; add the mint and season with salt, pepper and olive oil. Preparation: Cut the tomatoes into equal pieces, place them on a parchment covered baking sheet and season with sugar, salt and pepper. Cover the tomato slices with a sprig of rosemary, thyme and some garlic and splash with olive oil. Dry the tomatoes in the oven for approximately two hours at approximately 80 °C (175° F). The drying intensifies the taste of the tomatoes. Preparation: In a Thermo-blender, blend sugar, orange juice and Shiro Miso, gradually pour in the olive oil. Finally, stir in the orange peel and season to taste with salt. Preparation: Whisk the egg yolks with the sugar over a bain-marie until fluffy. Add the coconut pulp. Dissolve the gelatin as directed and stir into the egg yolk-coconut batter. Whip the cream and stir under the cold batter. Fill plates and refrigerate for approximately 3 hours. Preparation: Heat all ingredients to boiling (all but the fruits), simmer for 5 minutes and strain. Chop the fruits into small pieces (Brunoise) and mix with the sauce. Refrigerate for approximately 1 hour. Preparation: Heat heavy cream, milk, sugar and coconut flakes to boiling. Beat the egg whites with an electric mixer and stir briefly into the warm milk-cream batter. Let the batter rest briefly and strain. Then freeze in an ice cream maker. Read about first floor and the Hotel Palace Berlin in the Hotels and Resorts, Restaurants, Chefs' Recipes (German), and Spas sections.